Flexinol® actuator springs can be an alternative to straight Flexinol® actuator wires for applications with low force and high travel requirements. These springs can contract and relax multiples of their length. When Flexinol® actuator springs are used within the correct parameters high cycle life is expected. Pricing can be found clicking here, and adding crimps on the ends is also possible. 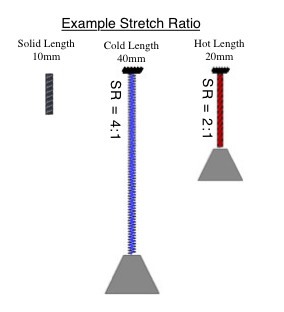 Stretch Ratio is defined as any length "L" over the solid length "SL", in any state, hot or cold. For example a spring with a SR of 4 cold and 2 hot, assuming a solid length of 10mm would then be 20mm hot, and 40mm cold. While these values will vary depending on how the springs are used, are still a reasonable starting point for a design. In your calculations please reference the displacement per coil in conjunction with the stretch ratio to help identify the appropriate length spring to purchase. The following chart gives rough guidelines as to how much current and force to expect with various Flexinol® actuator spring. *The Stretch Ratio "SR" and Displacement values are typically accurate, but remain approximate values. **** Approximate cooling time, at room temperature in static air, using a vertical spring. The last 0.5% of deformation is not used in these approximations. HT = High Temperature Flexinol® Actuator Spring.